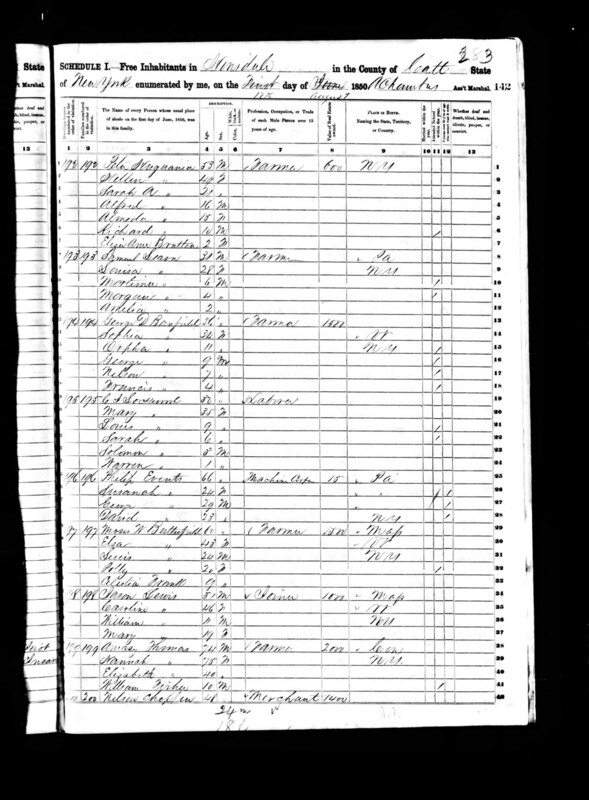 Parents of Philip Snyder, Jr.
Philip Snyder, married Mary Sharpsteen1 in approximately 1802 when he was about 20 and she was about 15.2 According to Peter Snyder's biography in 1896, they had twelve children3. 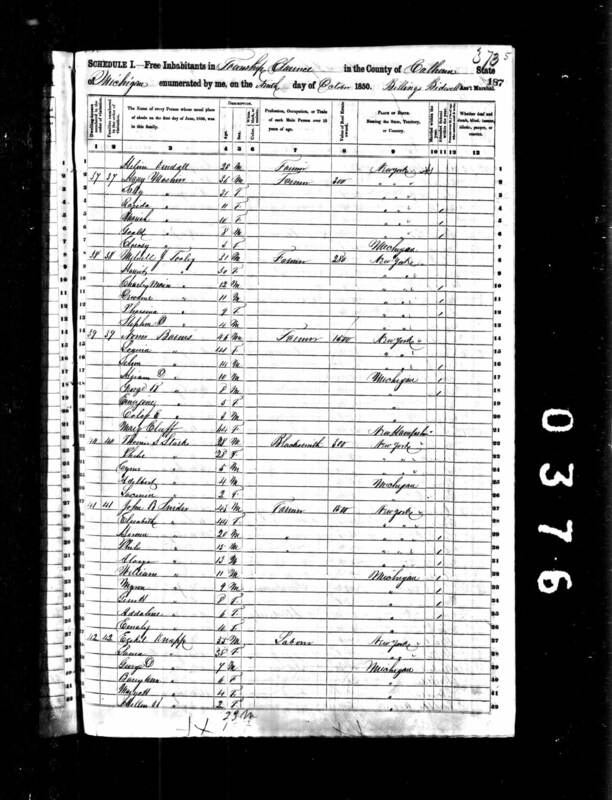 The following listing places the children listed in the 1896 biography in order based on birth dates estimated from census or other records. 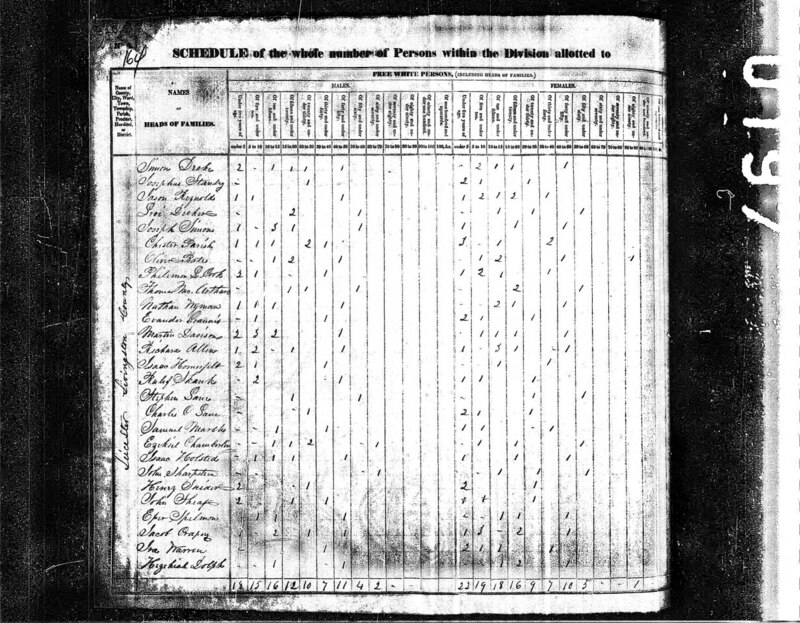 For those whose birthdates are not known, they are estimated based on 1830 and 1840 census records and the order they are listed in the 1896 biography. Philip b. 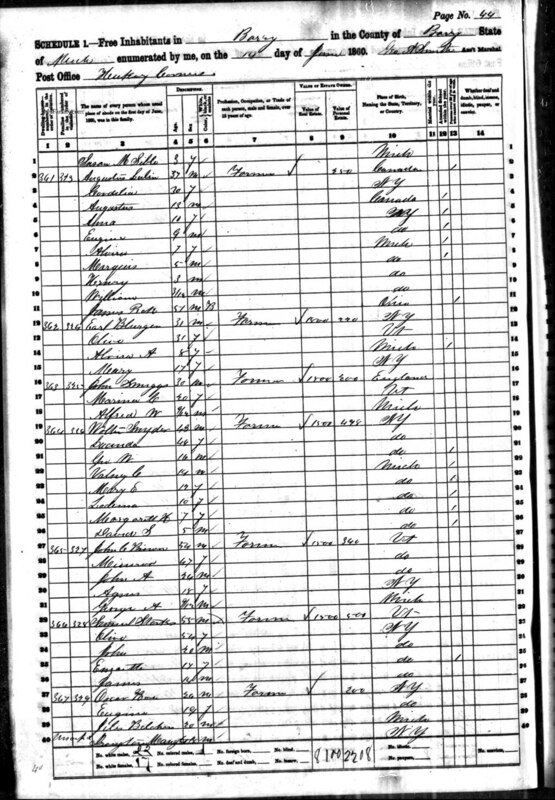 1820?34 35, d. in Michigan between 1860 and 1870? According to the histories, Philip came with Benjamin and Peter Snyder, although it is not known what their exact relationship was to Philip. 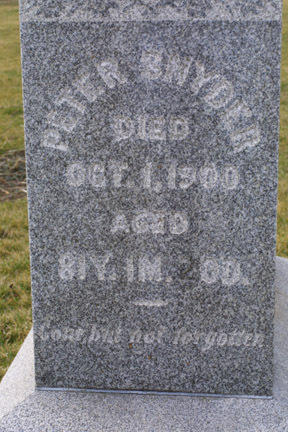 It has been hypothesized that they were brothers and that Peter was the Peter Snyder b. c.1793 (however there is also some evidence to contract this). In 1820, Philip Snyder is living with his family in the Town of Richmond, Ontario County, which is adjacent to Candice (see map made by Wilbur Everett). 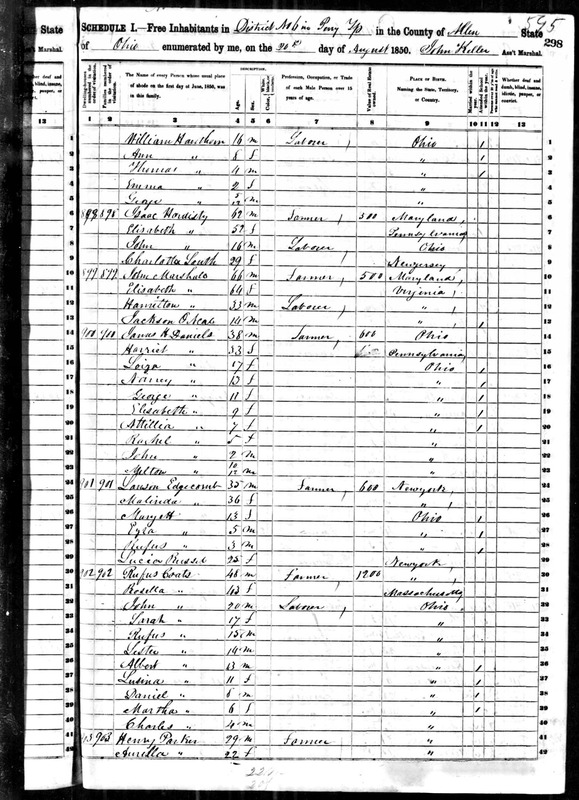 Philip and Mary's son Peter stated that he was born in Livingston County in 1820.1 However, this is not a major contradiction with the census data since Livingston County was formed from Ontario and Genesee Counties in 1821 and present-day Livingston Co., lies immediately west of Richmond and Candice. The recollections of Calvin Snyder (b. 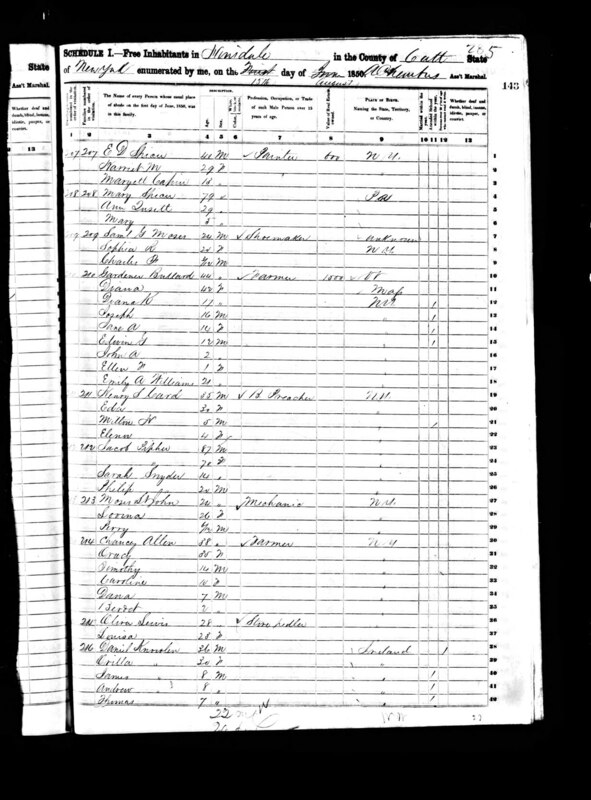 1874, son of Jasper Snyder 1854-1926 and grandson of Peter Snyder, b.1820) provide some interesting stories that may be related to the early history of this family. There are several items that are attributed to Peter Snyder, but that are more likely to have occurred in Philip Snyder's generation. One is a description of "a Dutchman from Pennsylvania ... [who] walked all the way from Pennsylvania... . [His] sole possessions consisted of the clothes he wore and an ax. Here he met a young red-haird German girl ..., who could not speak English." Could this be Philip Snyder and Mary Sharpsteen? Another story told by Calvin Snyder involves "another boy (I can't remember his name) who was stolen by the Indians and was tortured and killed. Grandfather wanted to bring his body back home. Someway he learned where the body was, took a team and wagon and went after him. To protect and conceal the body he had a load of turnips. He found the boy's body, put it in the bottom of the wagon, covered it with turnips and brought it safely home for burial." The "Grandfather" could not have been Peter Snyder, who was too young to have had encounters with Indians. However, it is possible that the story might have involved Philip Snyder and one of his oldest children in New York. There were Indians in New York when they lived there. Philip, Jr. died in about 18241. It appears that most of his family remained in New York until at least after 1840. The exceptions to this were Lorenzo and Peter, who moved to Trumbull Co., Ohio in about 1832 or 1833. Peter lived with Lorenzo for about year and afterwards worked by the month doing farm work during five months in the summer and attended school in the winter1 while Lorenzo and his wife Julia Ann apparently moved back to New York. In 1835, Lorenzo and his wife Julia Ann bought the southwest quarter of section 14 in Bath Township, Allen Co., Ohio. 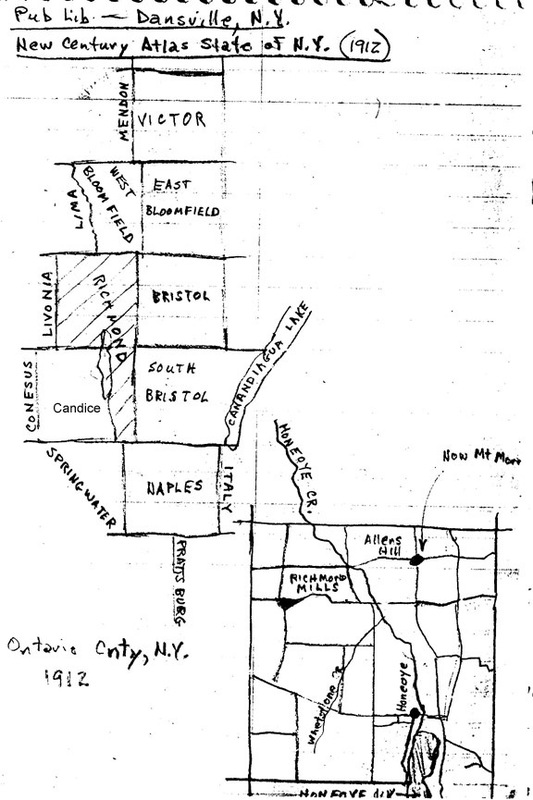 This is in the northwest part of the township where many other immigrants from northeastern Ohio settled, including the Bassitts and Edgecombs. It is not known whether Lorenzo and Julia Ann were still living in Trumbull Co. at that time or if the had already moved to Allen County, but by Sep 1838, when they sold the north half of this land, they were described as "of Allen County, Ohio"8. In about 1839 Peter moved to Bath Twp. and became acquainted with the family of Uriah and Betsy Edgecomb (who had come from Trumbull County in 1832). The next year on April 9th, Peter was married to their daughter Clarinda. Unlike the rest of Peter's family, he and Clarinda remained in Allen County, Ohio for the rest of their lives3. 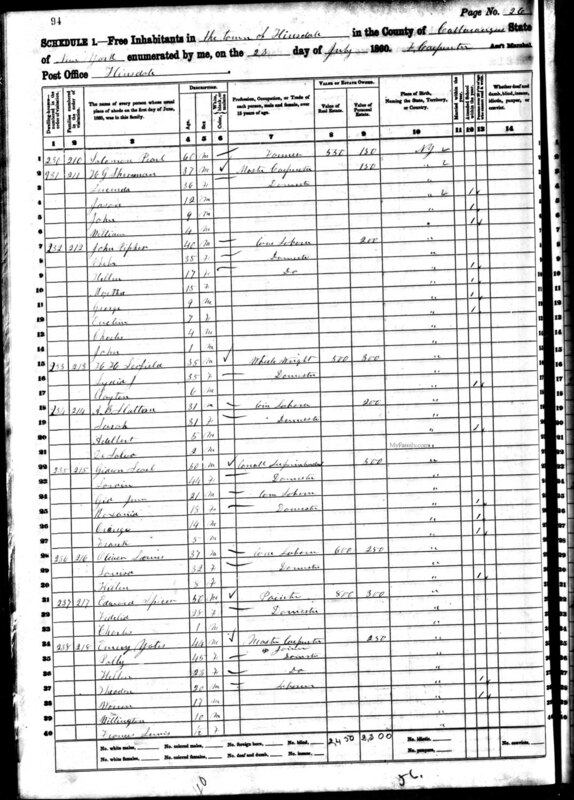 In 1840, Cornelius was also living in Richland Twp., Allen Co., OH (see below), but by 1840, Lorenzo and Julia Ann had already moved back to New York and were living in Hinsdale, Cattaraugus Co., NY.9 Other family members moved to Cattaraugus Co. as well, perhaps when family land in Ontario County was sold in 1838. There seems to have been a mass exodus of the family to Michigan in the 1840's. Between 1845 and 1847 Lorenzo moved to Calhoun Co., Michigan. Other siblings including John, Henry, Cornelius, Mary, Walter, Louisa, Philip (III), and Phebe eventually ended up in Michigan as well3. 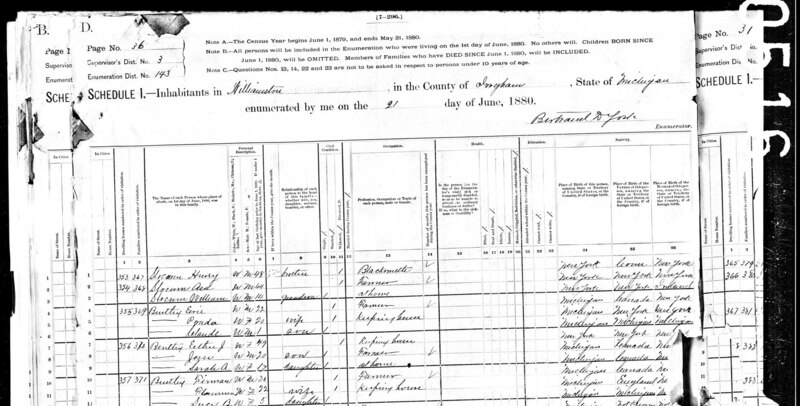 It is not known whether William lived in Michigan, but he was said by Peter to be living in Iowa in 18963. 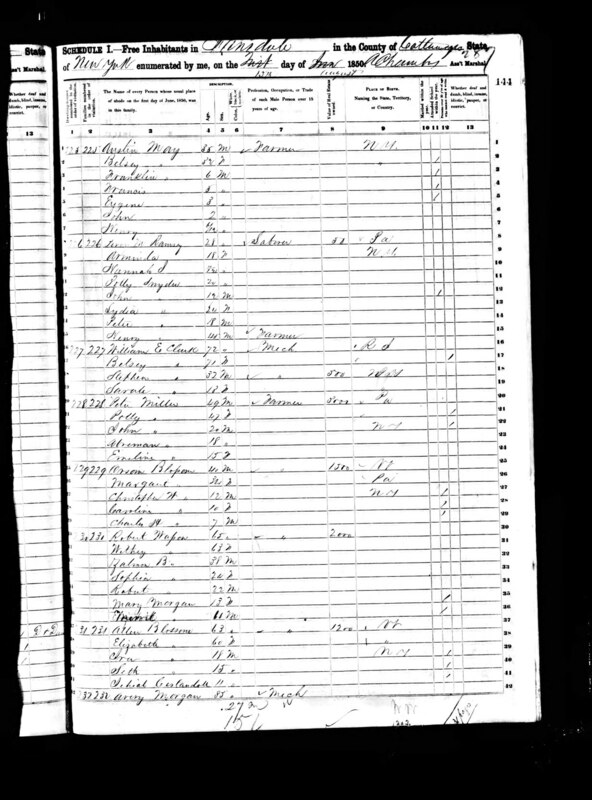 The 1880 census14 shows William Snyder (aged 68) and wife Rachel E. (aged 60) living in State Center, Marshall Co., Iowa. William and both of his parents were listed as born in New York. It is extremely likely that this is the William son of Philip Snyder, Jr. Thus his birth date would be about 1812. Since Walter is a relatively common name, it is more difficult to ensure that we have identified the correct one. However, there is a Walter Snyder, married to Lucinda, who fits well with the requirements for the Walter son of Philip Snyder, Jr. 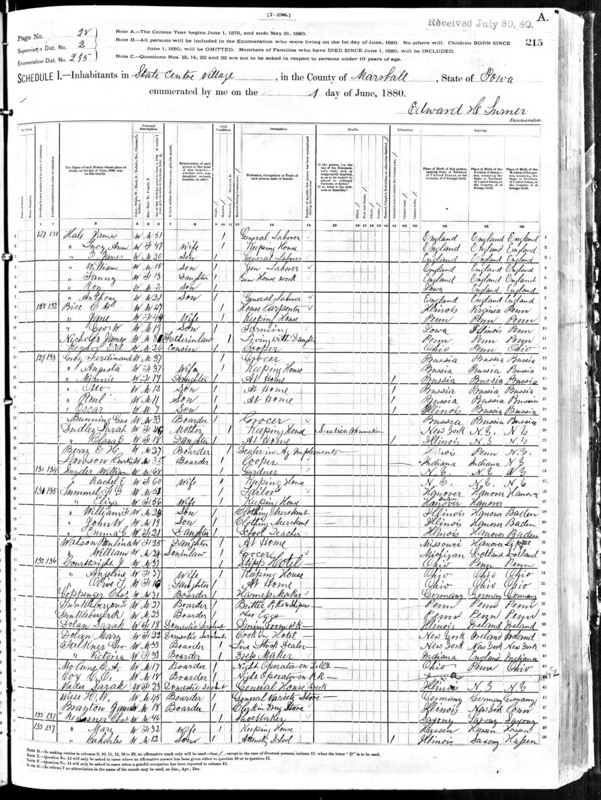 In 1850, he was listed in Pontiac, Oakland Co., MI as a miller aged 33 and born in New York with wife Lucinda, aged 36 and also born in NY.30 His children Julia (8) and George (6) were listed as born in New York and Volney (a male, 4) and Mary (2) were listed as born in Michigan. That would indicate that they moved from New York to Michigan in about 1845, which is about the time other siblings moved from New York to Michigan. It is also noteworthy that Julia was the name of Walter's sister-in-law and George and Mary were also names in the family. 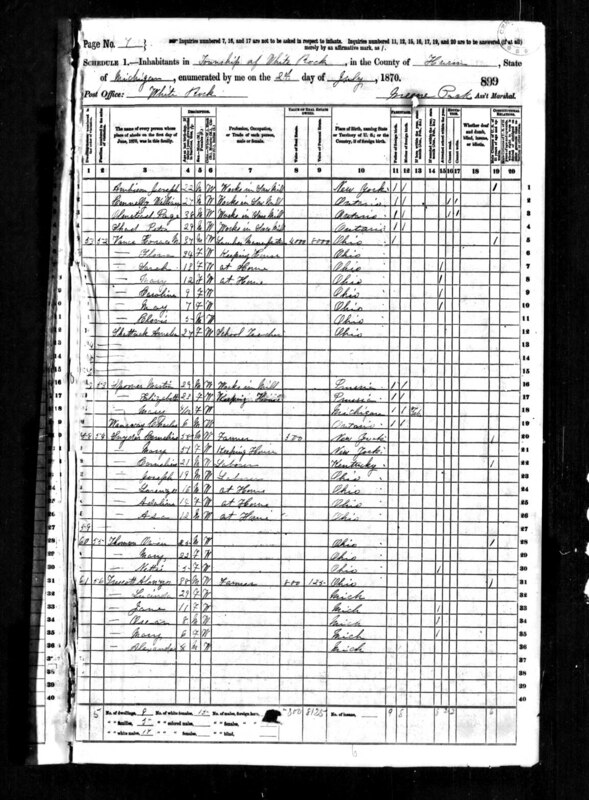 In 1860, the family was listed in Barry, Barry Co., MI with children listed as: Geo. M (16), Valney C (14), Mary E (12), Lucinda (10), Margarett H (7), and David S (5) with George born in New York and the rest born in Michigan. 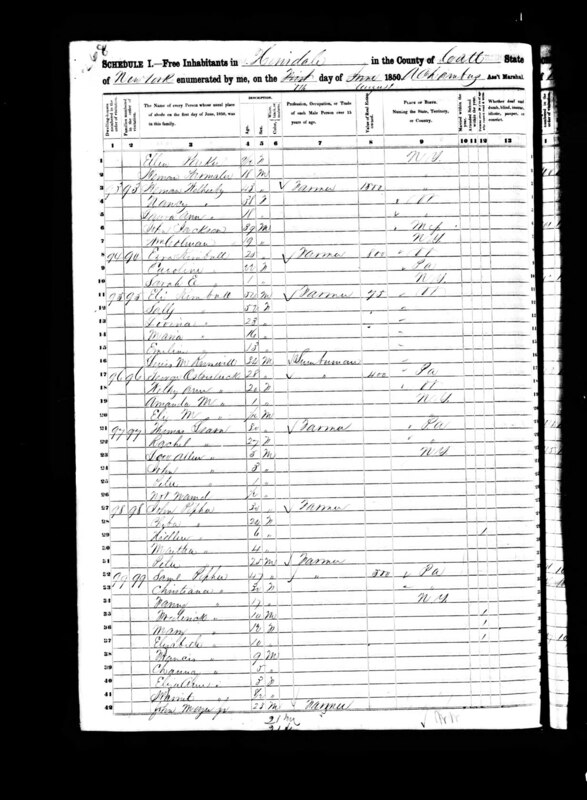 It should be noted that Barry Co., MI was also where Louisa Learn, Walter's sister also lived. In 1870, Walter and Lucinda are still living in Barry with Margaret (17) and Daniel (aged 15 and not David as listed in the earlier census).32 In 1880, Walter S. Snyder (63) and Lucinda B Snyder (65) are listed for Barry. They are still living with Margarett H (27, a school teacher) and Daniel S (25).33 The listing also shows both of Walter's parents to have been born in New York, which is consistent with Philip and Mary Snyder as his parents. 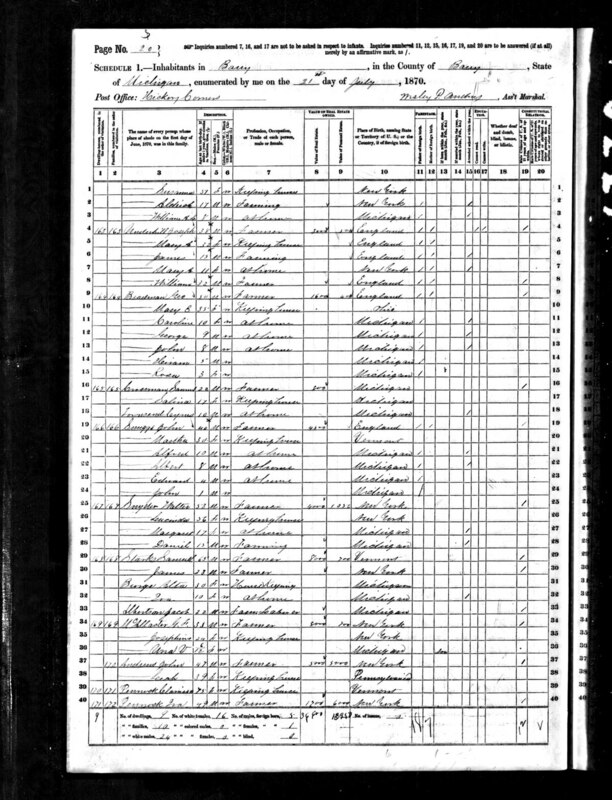 Cornelius was said by Peter to have died in Michigan before 1896.3 There were few Cornelius Snyder or Sniders and one who was listed in the 1870 census in White Rock, Huron Co., Michigan16 was aged 58 and born in New York. It is noteworthy that one of the children listed in the household was named Lorenzo. Given the relative uncommonness of that name, this suggests strongly that this Cornelius was a brother of Lorenzo. The birthplaces of the children suggest that the family was living in Ohio in 1850. 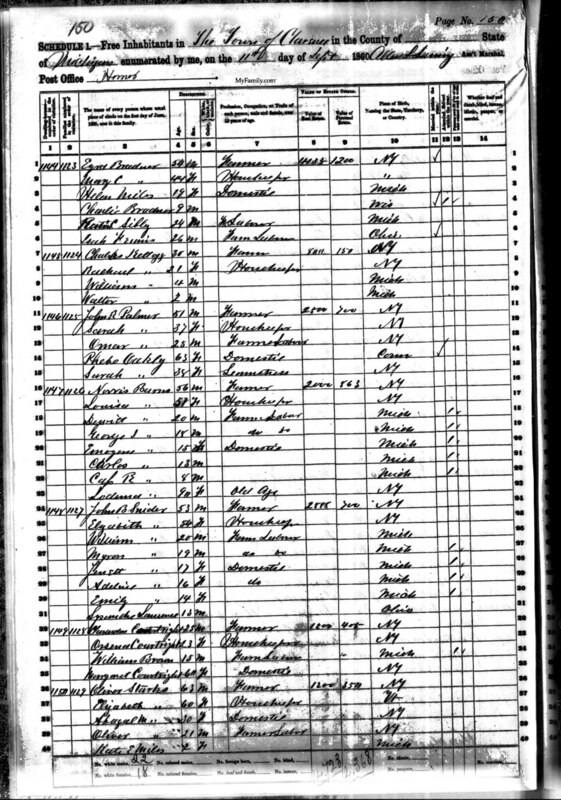 A search of the 1850 census for Ohio turns up the same Cornelius living in Perry Township, Allen County, OH.17 This is near where Peter Snyder (b. 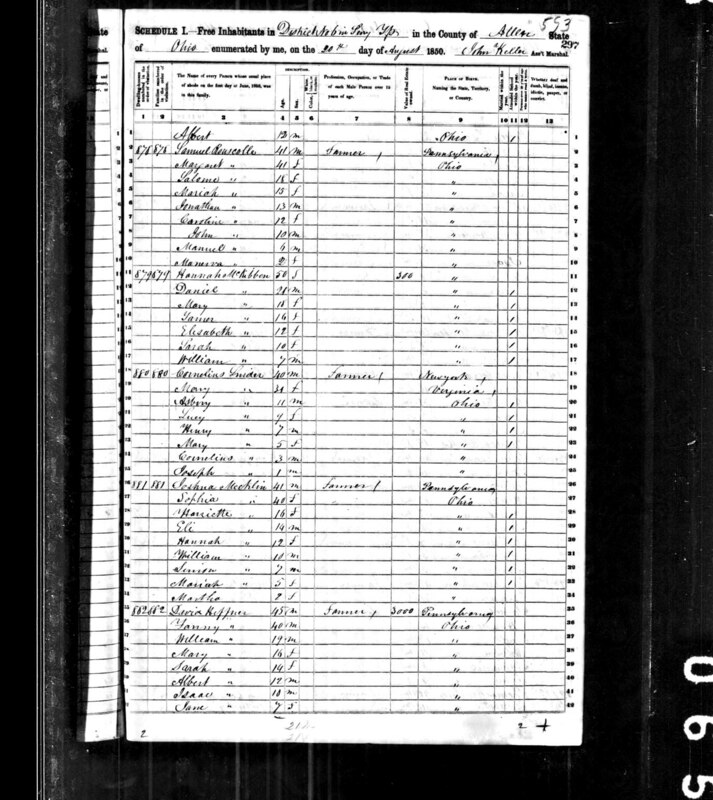 1820) was living at the time, again strongly suggesting that this Cornelius was one of the children of Philip Snyder, Jr. Other circumstantial evidence: child named Henry (name of brother and middle name of grandfather), child named Mary (mother), and proximity in 1850 to Lansil Edgecomb, an older brother of Peter's wife Clarinda. 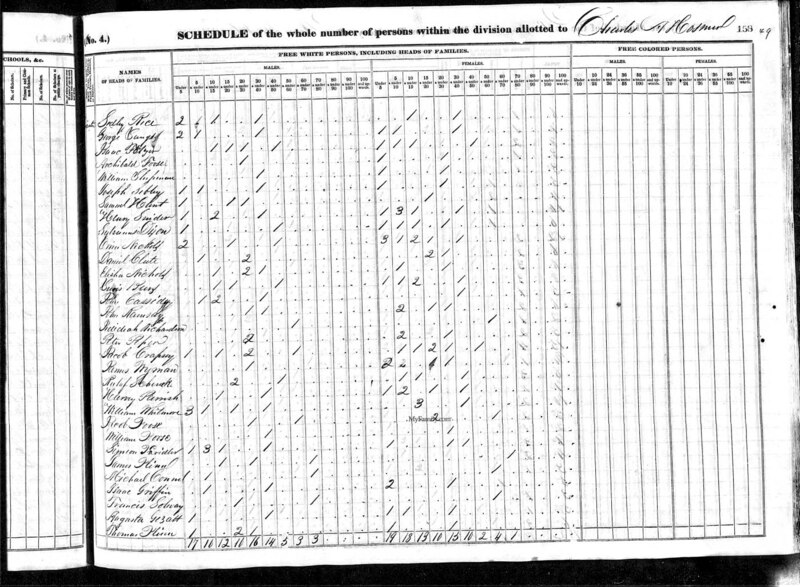 There are also two Cornelius Snyders (aged 20-30 with wives aged 20-30 and single males under age 5) that are listed in the 1840 census for Putnam County (one in Blanchard Twp.21 and the other in Richland Twp.22). Richland Township touches Bath Township at the corner near where Peter and Lorenzo were living in 1840, so it is likely that Cornelius (son of Philip Snyder, Jr.) was living there in 1840. 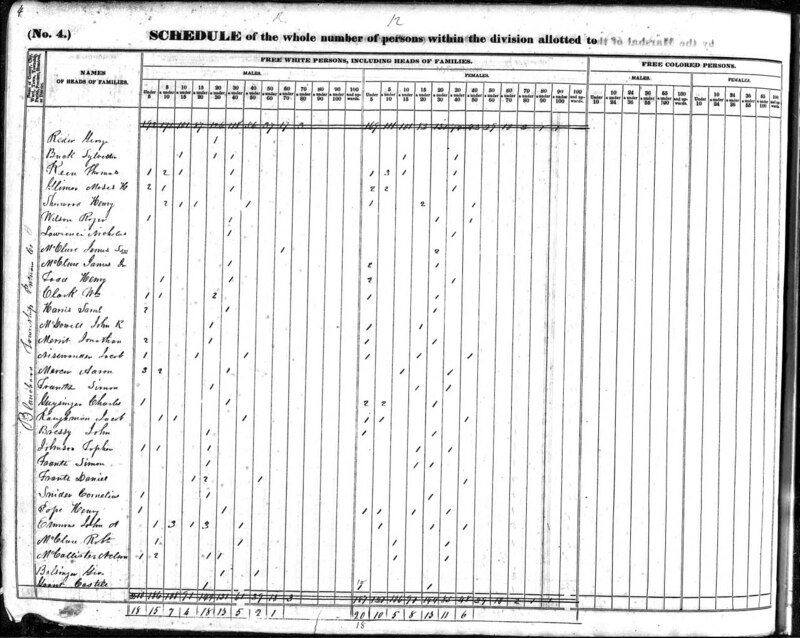 This is supported by the birthplace of his son, Asbery, who was listed as born in Ohio in 1839.17 The 1870 census age suggests a birthdate for Cornelius of c.1812 and the 1850 census suggest c.1810. 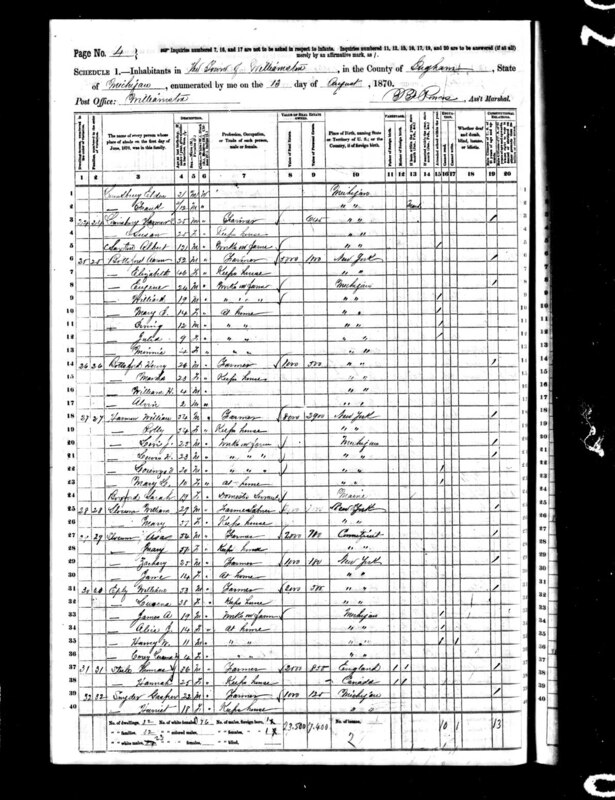 Mary Slocum and her husband Asa lived in Andover, Allegany Co., NY in 185023 with children Henry (b. c.1838), Esther (b. c.1839), Susan (b. c.1843) and Zachary (or Zacoriah b. c.1849). They were still living there in 186024 with an additional child Jane (b. c.1855). By 1870, Asa and Mary had moved to Williamston in Ingham Co., Michigan.25 Zachary and Jane were listed in the same household and a William Slocum (aged 29) was listed next door. 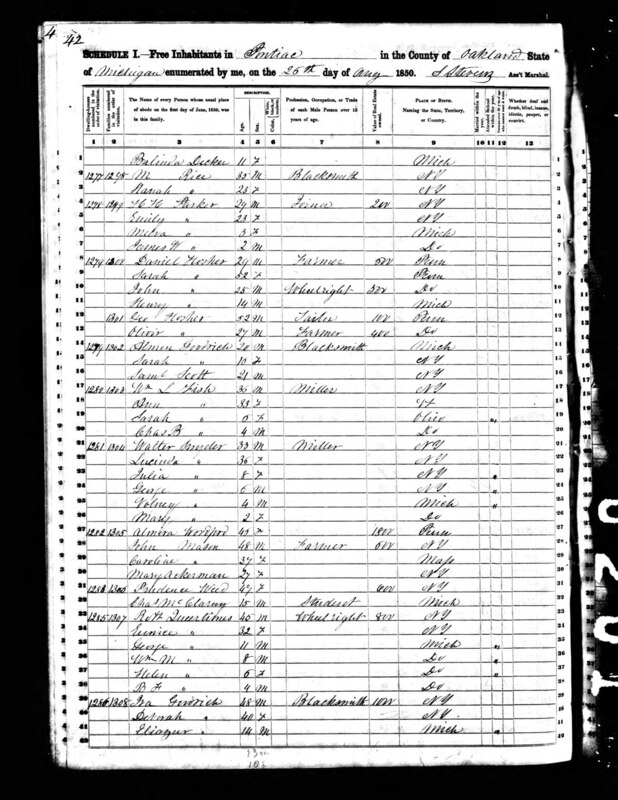 In 188026, Asa is listed without Mary and with a grandson William in his household and living next to Zackery and his family with brother Henry. Presumably Mary died between 1870 and 1880. As was the case with Walter, Philip is a common name, so there is reduced confidence that we have the correct one as Philip Snyder, III. There is a candidate: Philip, b. c.1820. 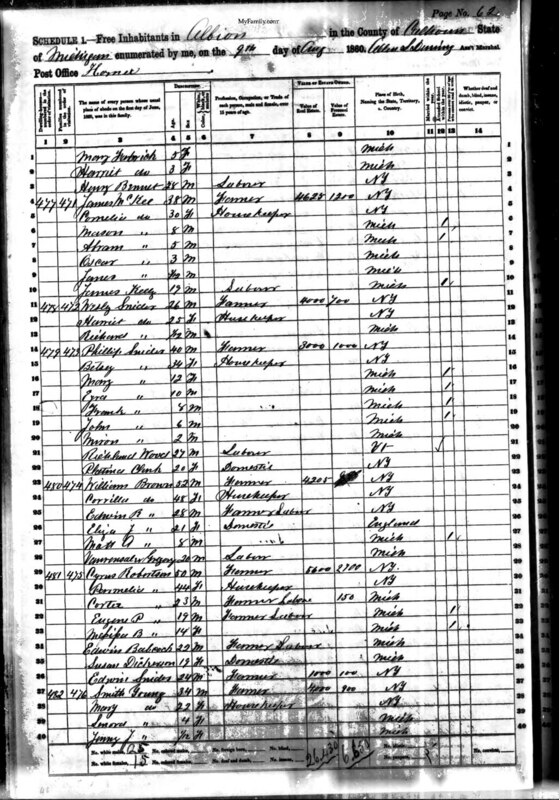 He is listed in the 1850 census for Albion, Calhoun Co., MI, aged 30 and born in New York.34 He is living with Betsey (26 and b. NY), Mary A (2) and Ezra A (5 months). Both children were born in Michigan, so he would have had to have left New York before 1848. The same Philip (40) and Betsey (34) are listed in Albion in 1860.35 They then had Mary (12), Ezra (10), Frank (8), John (6), Miron (2) as family members. In the 1870 census, only Betsey (43) is listed as the head of household.36 This suggests that Philip may have died between 1860 and 1870. Members listed in the household were Ezra (20), Frank (18), John (15), Myron (11), Jennie (8), and Hattie (4). If this is the correct Philip, his estimated birth date of 1820 would make him a probable twin of Peter. 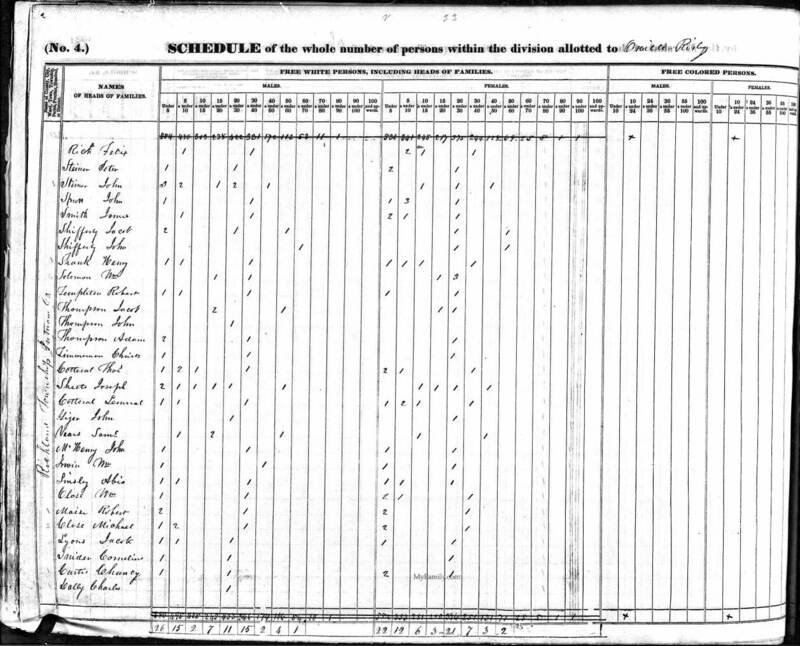 Phebe was said by her brother Peter to have been a "Pifer".3 In the 1840 census for Hinsdale, Cattaraugus Co., NY,9 Lorenzo is listed immediately after a Jacob Pipher whose household contained Jacob (aged 70-80), a female (aged 50-60), and a male and a female both aged 15-20. The younger male may have been Lorenzo's sister's husband John, who would have been aged 20. 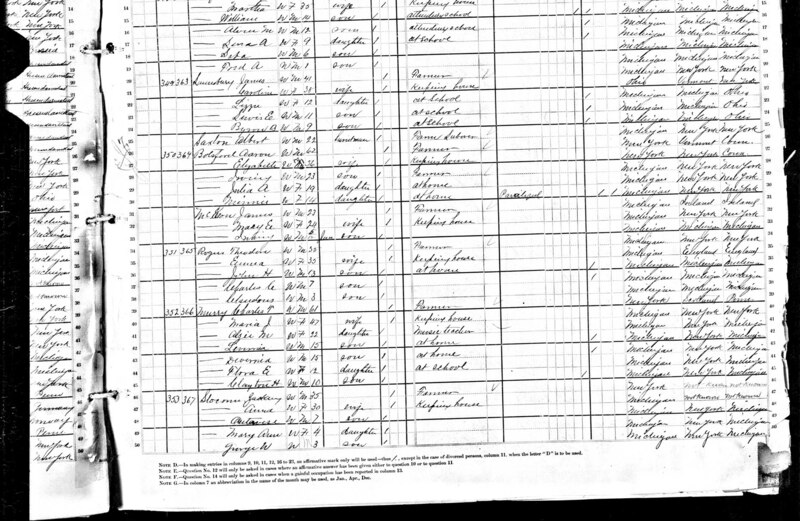 In the 1850 census for Hinsdale, John Pipher (aged 30) is listed with wife Pheba (aged 24) and children Helen (6), Martha (4), and Peter Pipher (25).27 Jacob Pipher is also listed in the 1850 census29 (aged 87) and interestingly he has in his household a Sarah Snyder (aged 14) and Philip Snyder (aged 20). Could these be descendants of Philip Snyder, Jr.? 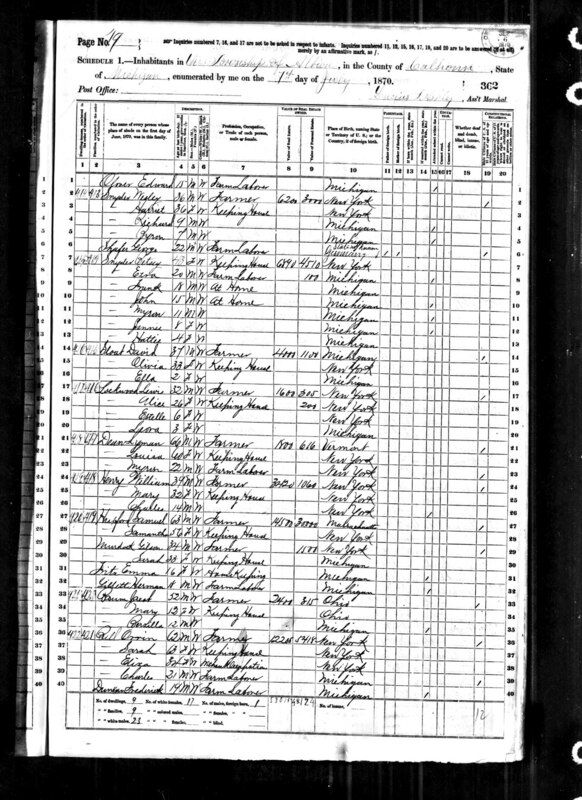 In 1860, John (aged 40) and Phebe (aged 35) are listed in Hinsdale with Hellen (17), Martha (15), George (9), Eveline (7), Charles (4), and John (1).28 These census records suggest that Phebe was born about 1825, which is at odds with Peter's statement that he was the youngest child in the family. Also, if Philip died in 1824, Phebe would have had to have been born soon after. However, since this Pipher family is closely associated with the Snyders in Hinsdale and since both Phebe and Pipher are relatively uncommon names, it is almost certain that this Phebe Pipher is the daughter of Philip Snyder, Jr. This account was originally taken from History of the Edgecomb, Bassitt, and Snyder Families of Allen County, Ohio by Steven J. Bassett Baskauf, 2007 although it has now been heavily modified. This portion of the book is freely available under a Creative Commons Attribution 3.0 License provided you give the citation listed above. On the web, a link to this page would be helpful. 1. History of Allen County, Ohio. Chicago: Warner, Beers & Co., 1885. p.587-88. 2. 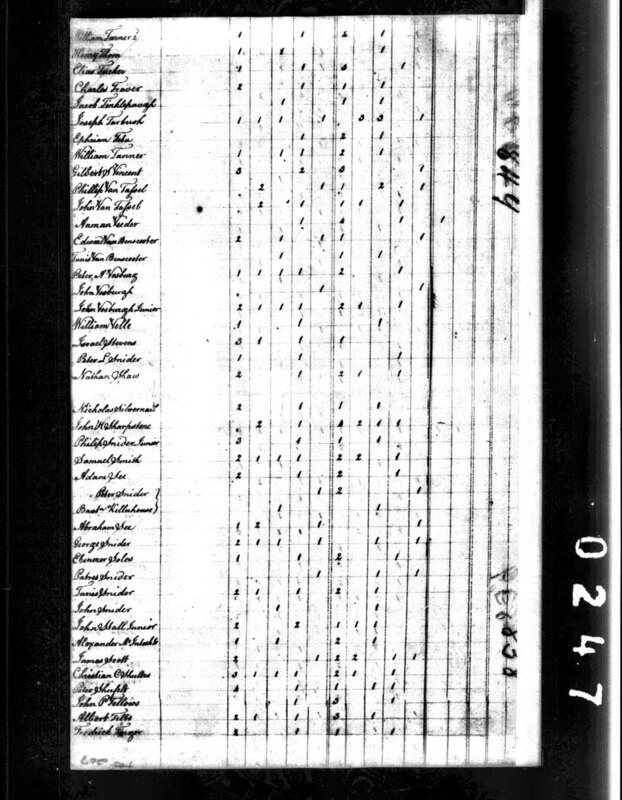 This estimate of their marriage date and ages is based on the estimates of birth dates of the children made here and on birth dates of 17 Jan 1782 for Philip from information from J. Max Anderson (family group sheet) and 13 Nov 1787 for Mary from J. Max Anderson. 2006. A History of Johann Jost Snyder and Anna Magdalena Elizabetha Flagler of Palatine Immigrants to America in 1710. Salt Lake City, Utah. p. 45. 6. "Town of Candice History" from History of Ontario Co., NY, 1878, p.253-258 "In 1815, Benjamin, Peter, and Philip Snyder came to Ball Hill. The first took the REMY place, Peter the WHITBECK farm, and Philip the east portion of the lands of the brothers Orlando G. and Andrew BROWN. � Philip Snyder sold to D. ADAMS in 1838, and from him title descended to Ira MERRILLS and Jairus COLEGROVE, who sold to the brothers named. Benjamin Snyder sold to E. MACOMBER and H. GREEN. J. DAVIDSON, S. PHIPPS, S. R. HICKOK, and J. DEWEY were successive owners prior to John REMY, the present possessor. Peter Snyder and Captain GRANBY, a sea-captain in the war of 1812, were almost simultaneous settlers on this farm. The captain soon died. 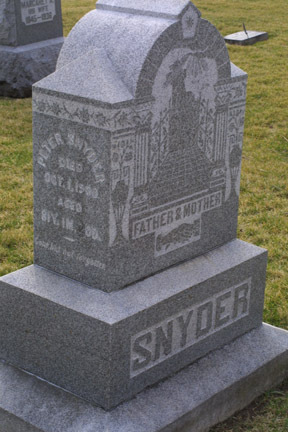 SNYDER sold to John CHAMBERLIN, he to I. W. MITCHELL, and Hart and Murray, Isaac GIFFORD, and Jacob WHITBECK�". Note: In New York, a "town" represents a subdivision of a county (analogous to a township) and not a settlement or village. A potential problem with this history is that it says that Philip Snyder sold to D. Adams in 1838. We know from Peter Snyder's (b. 1820) history that his father Philip Snyder died in about 1824. However, it is possible that this indicates that the heirs of Philip Snyder (i.e. his wife Mary) sold the land in 1838. 8. 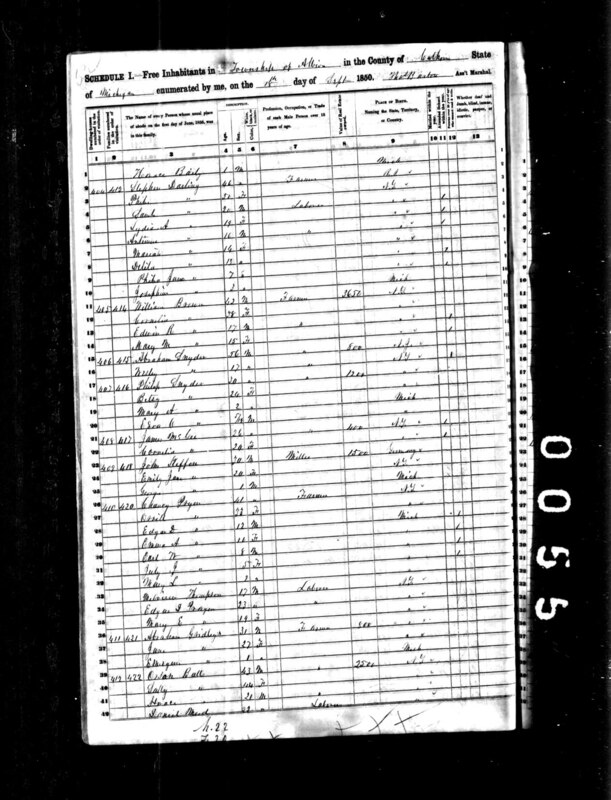 Deeds, Book F, p. 188, Allen Co., OH Recorder's office. 25 Sep 1838. 10. Anderson. 2006. p. 45. 11. Tombstone of Lorenzo Snyder, Austin Cemetery Section 22, 15 Mile Road, Convis Township, Calhoun Co., MI. "LORENZO SNYDER Died Dec. 3, 1852 AE 43 ys. 9 ms. & 22 ds." (as best as can be read from the image of the stone). This gives a birth date of 9 or 11 Feb 1809 depending on how the subtraction is done. 12. Tombstone of Julia Ann Snyder, Austin Cemetery Section 22, 15 Mile Road, Convis Township, Calhoun Co., MI. "JULIA A. 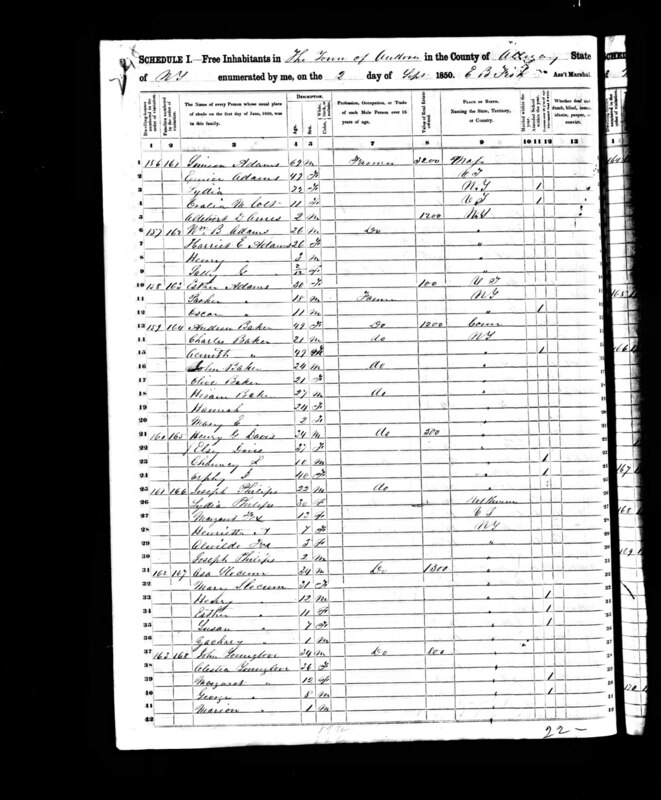 WIFE OF L. SNYDER 1816-1904"
Cornelius Snyder 58 b. NY, Mary 57 b. NY, Cornelius 21 b. KY, Joseph 19 b. OH, Lorenzo 16 b. OH, Adaline 14 b. OH, Asa 12 b. OH. 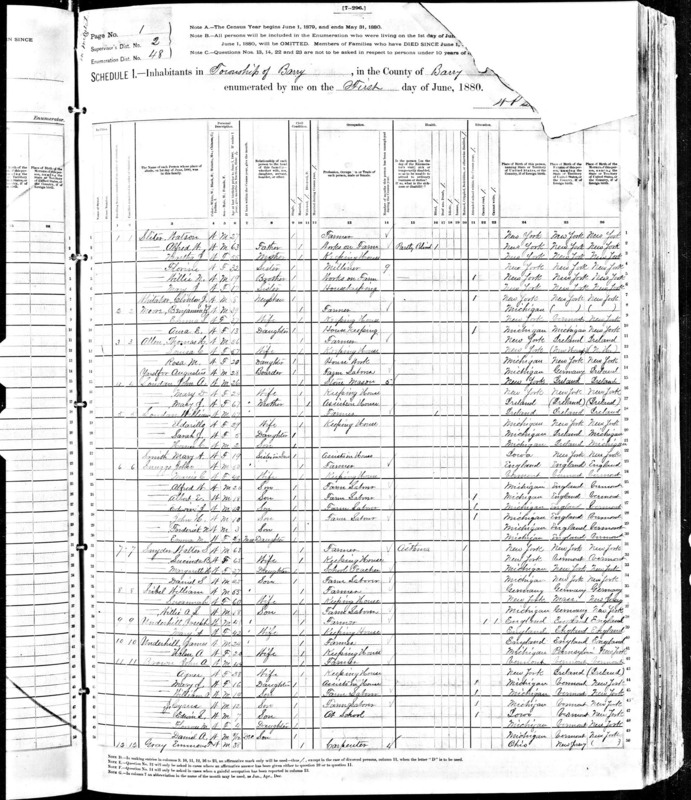 Cornelius Snider 40 b. NY, Mary 37 b. VA, Asbery 11, Lucy 9, Henry 7, Mary 5, Cornelius 3, Joseph 1 (all born in OH). Henry Snider: one male 30-40 [Henry], two males 10-15 [Peter but he would be 8, and ? ], one male under 5 [John], one female 30-40 [wife of Henry], one female 10-15 [Lydia], three females 5-10 [Arminda, Polly and ? ], one female under 5 [?]. Note: supposition of identities based on record below. 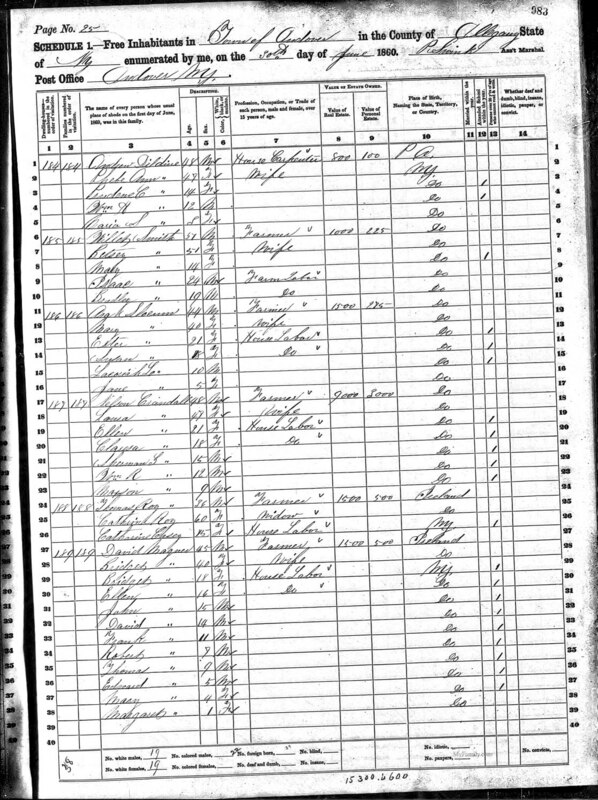 This household is not listed under the oldest male, who is Henry Snyder (aged 45). Rather the head of household is listed as Perry M Ramsey (age 28). It is likely that Arminda Ramsey (age 18) is his wife and a daughter of Henry Snyder. The others listed in the household are all Snyders and presumably children of Henry: Lydia (aged 24), Polly (aged 20), Peter (aged 18), John (aged 12). Note: This record apparently contains some errors. It appears that originally William Slocum was listed as head of household. However, Zachary and Jane were erased and added below when Asa Slocum was listed as head of household. The birthplaces were also changed from New York to Connecticut. Note: There is again some confusion here as Henry's father is listed as being born in Conn. There are also some age differences. This needs further study and clarification. See also the 1956 account by Calvin Snyder, which contains potential clues about early Snyder history in the U.S.
one male 26-44 (Philip aged 28), three males under 10 (Henry aged 5, John aged 3?, and Lorenzo aged 1), one female 16-25 (Mary aged 23), one female under 10 (Lydia aged 6?). one male 26-45 (Philip aged 38), one male 10-16 (Lorenzo aged 11, older two boys not with the family? Henry may have stayed with his Sharpsteen grandfather - see above), three males under 10 (Cornelius aged 9, William aged 8, Walter 3), one female 26-45 (Mary aged 33), one female 10-16 (Lydia aged 13? ), two females under 10 (Mary aged 1 and ?). 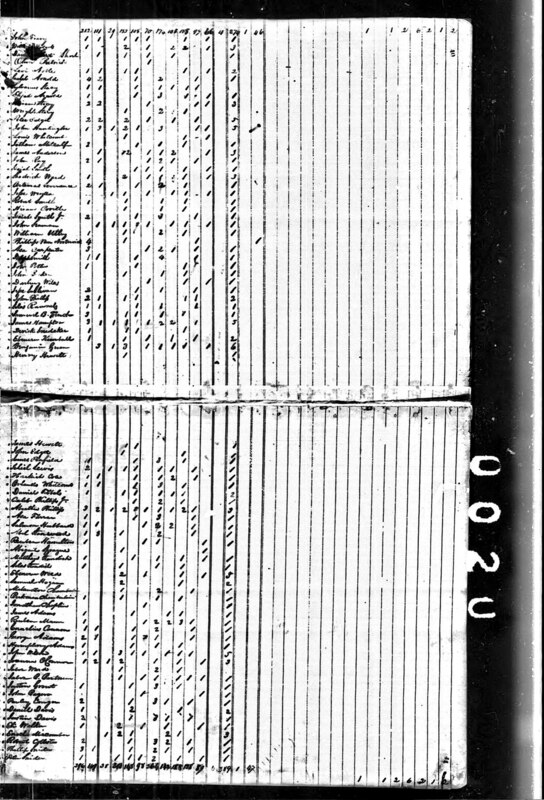 According to the census records (above) Louisa and Phebe were born after Peter, which contradicts Peter's statement that he was the youngest child of the family. Of course it is possible that he said something like "I was the youngest boy" and that was misrepresented as "youngest child". For historical purposes, I am leaving the Snyder posts on the website. However, the information there has been superseded by information here and on other regular web pages.